America’s Best Elite Combination Bathtubs provide a luxurious whirlpool experience with soft tissue massage jets using millions of heated air bubbles and high pressure water jets to massage and sooth joints and muscles. The Elite offers 20% more water depth which allows for multiple back and neck jets. A two person air/water combination bathtub where bathers sit facing each other. The water jets massage each bathers back, hips, legs, feet, etc. and air jets (injectors) are placed in the floor of the tub to provide the bather an entirely different massage experience. The width and leg room of this outstanding design is unmatched by any other bath 60”L x 48”W; Watertech’s exclusive top overflow design allows all Elite combo baths to be filled within 2 inches of the top of the bathtub insuring the bather gets an extra deep full body massage while a jacuzzi style bathtub with a standard side overflow has a water bathing level 4” – 6” inches below the top of the bathtub. An outstanding bathtub for a corner installation. Two other corner models available are the C6262 and C6060. This two person jacuzzi style bath has distinctive seating areas and back jets arranged for an optimal neck and back water massage. Numerous air injectors are placed in the floor to provide a soothing air massage for the body. Watertech’s exclusive top overflow design allows all Elite combo baths to be filled within 2 inches of the top of the bathtub insuring the bather gets an extra deep full body massage while a jacuzzi style bathtub with a standard side overflow has a water bathing level 4” – 6” inches below the top of the bathtub. The C6636 Elite combination bathtub offers a touch of luxury in a bath that will fit in most restricted spaces. This extra deep design with a specially engineered overflow allows for 20% more water depth making this model along with the 6032, 6036 and 7236 Elite models the deepest tub of their size. The top overflow allows for multiple back jets which will massage your entire back unlike many baths that only massage a portion of your back. A perfect choice for anyone needing extra leg room. 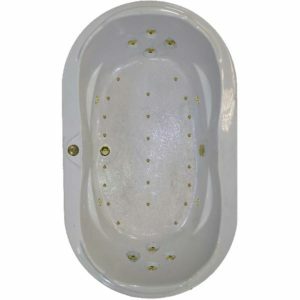 This one person combination air/water massage bathtub has two gently curved indentions in the foot of the tub that gives this tub more leg room than any comparable bathtub. 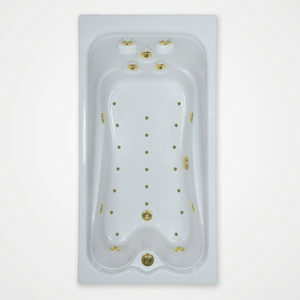 This extra deep bathtub has 5 recessed water jets massaging the back and 6 additional water jets located around the tub massage the rest of the body. Numerous air jets (injectors) are placed in the floor to provide an entirely different air massage experience. 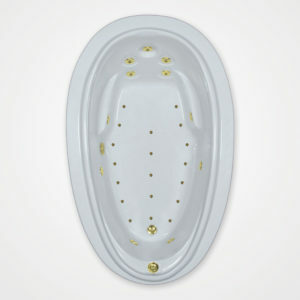 This Oval shaped single person design provides an air and water massage from the soles of your feet to you back and neck. 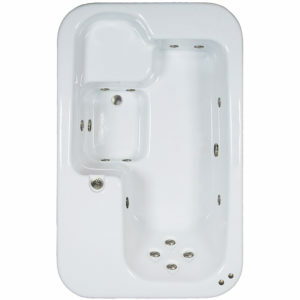 This combination jacuzzi style bath has two sloping arm rests and detailed molding. An extremely large bathing area with extended leg room. Watertech’s exclusive top overflow design allows all Elite combo baths to be filled within 2 inches of the top of the bathtub insuring the bather gets an extra deep full body massage while a jacuzzi style bathtub with a standard side overflow has a water bathing level 4” – 6” inches below the top of the bathtub. 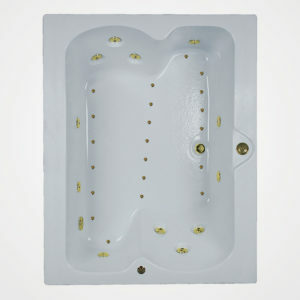 A two person combination air and water hydrotherapy bathtub. The bathtubs wide bathing area allows bathers to sit side by side. Extra leg room is provided each bather by gently curving the foot end of the tub. 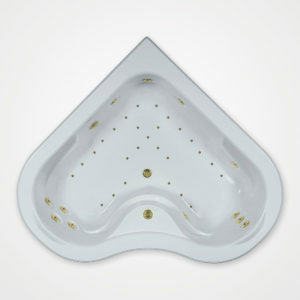 Six recessed water jets massage the bathers back area with six additional water jets, located in the walls of the tub, provide an aggressive water massage. 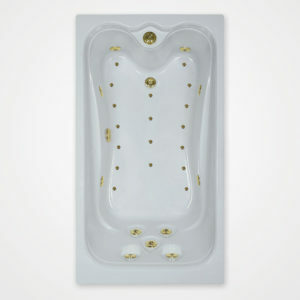 The floor air injectors (air jets) in this bathtub complete the full body massage experience. Rounding the tubs corners give a pleasing visual design to any bathroom. Beautiful scalloped top deck overflow allows water to cascade over the bathtub’s bathing well into a perimeter overflow channel, if the bath is accidentally overfilled. 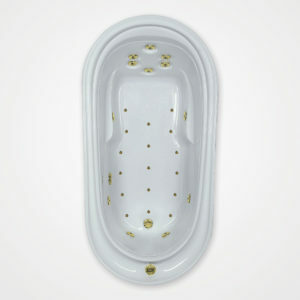 An Oval one person air and water comb bathtub with sloping arm rests and extra leg room. 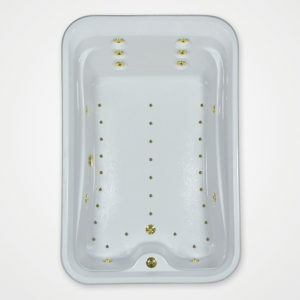 Watertech’s exclusive top overflow design allows all Elite combo baths to be filled within 2 inches of the top of the bathtub insuring the bather gets an extra deep full body massage while a jacuzzi style bathtub with a standard side overflow has a water bathing level 4” – 6” inches below the top of the bathtub. 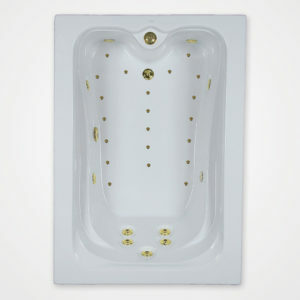 The C7343 Elite is the stylish new whirlpool and air massage bath has an eye pleasing oval shape. Gently sloping arm rests and elevated headrests allows the bathers to comfortably stretch out, relax and have their bodies massaged in a private tranquil environment designed with you in mind.